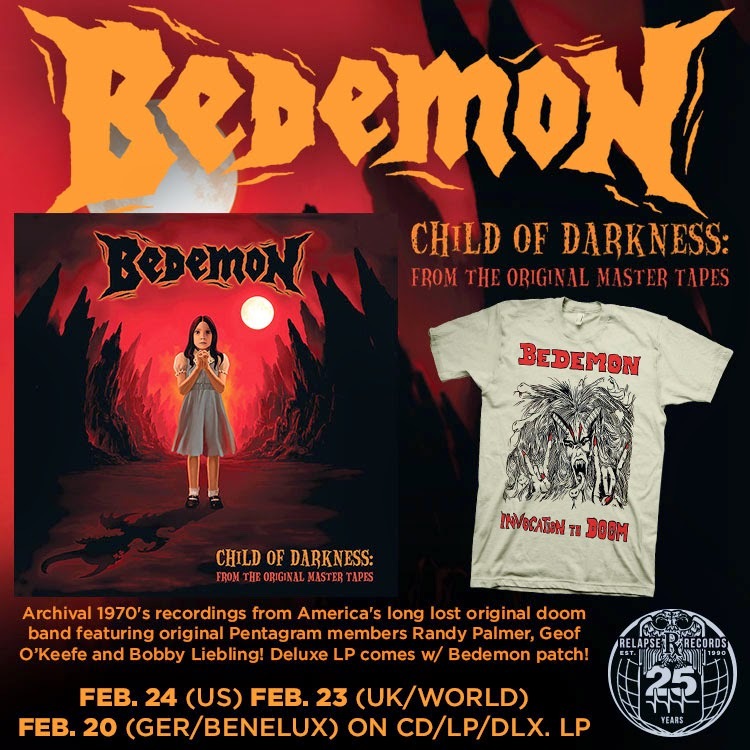 Next month, Relapse Records will release the official re-issue of BEDEMON's archival recordings, Child of Darkness. Widely considered America's first doom metal band, BEDEMON formed in 1973 and consisted of original Pentagram members Randy Palmer, Geof O'Keefe, and Bobby Liebling. The group was an offshoot of Pentagram, with a darker and doomier tone. BEDEMON recorded various sessions spanning from 1973-1979 which are being made available once again after being out-of-print for over 10 years. Child of Darkness will be made available on CD/LP on February 24th. Pre-Orders are available HERE while the title track is available for listening below. Additionally, the release includes extensive liner notes from original members Mike Matthews and Geof O'Keefe and is a must for fans of Pentagram or traditional doom metal. BEDEMON's Child of Darkness is truly a crucial glimpse into the nihilistic minds that gave birth to an entire genre!